New for 2018 at Standard Concession Supply...Big League Chew in Sour Apple Flavor. Shredded style bubblegum packed in a pouch is the favorite bubblegum from little leaguers to the big leaguers. You get a lot in every pouch. 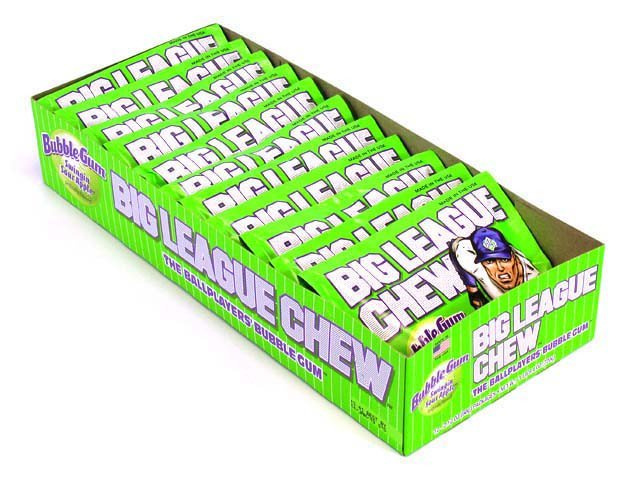 This Sour Apple Big League Chew is pack 12 - 2.1 oz pouches per box. New at Standard Concession Supply for 2018...Watermelon Flavor Big League Chew Bubblegum. Shredded style bubblegum packed in a pouch is the favorite bubblegum from little leaguers to the big leaguers. You get a lot in every pouch. This Watermelon Big League Chew is pack 12 - 2.1 oz pouches per box. Also available in grape flavor.